"He's the best there is! Actually, he's the only one there is!" Right before the big Super Bowl game, someone steals the Miami Dolphin's prized mascot, a dolphin that does tricks with a football. What are the owners to do? 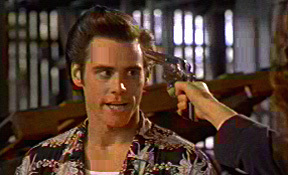 Go to a rather off the wall, wacky pet detective, Ace Ventura! The basic story tells the tale of Ace Ventura's efforts to uncover who and why the mascot of the Miami Dolphins was kidnapped, and bring the dolphin back to the stadium before the big super bowl game. 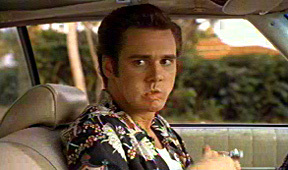 Jim Carrey's comedic talent is show-cased in this unusual script, and holds the story together. 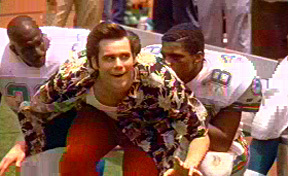 The script offers a good arena for Carrey's rubber face and body. Jack Bernstein and Tom Shadyac & Jim Carrey wrote the wild screenplay, that bases its humor on "exaggerated, comic absurdity", which works 90% of the time, if you enjoy this kind of humorous genre. 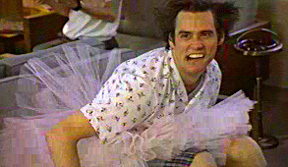 This is the film that really launched Carrey's career, who was primarily known from TV's, "In Living Color". After a string of successes, including "The Mask", "Dumb and Dumber", "Ace Ventura: When Nature Calls", "Liar Liar" and "The Truman Show." Carrey is one of Hollywood's highest paid stars. There are many entertaining scenes in this goofy comedy. 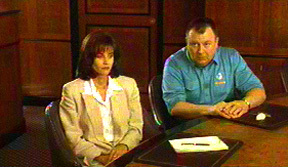 The opening hilarious sequence of scenes are a good example of this genre. Ace Ventura has disguised himself as a package deliverer, working for a private delivery service, like UPS. He is carrying a box marked fragile. On his way to his destination he drops, kicks, does antics with the package, to be sure everything is broken inside. Carrey shows what popular theory thinks about how fragile packages are really handled by carriers, When he gets to the apartment, he gives the rough-looking guy inside, some paperwork to do. He sees his client's little dog, swaps it with a toy dog look-a-like, and puts the real dog in his shirt. About 5 minutes after he leaves, the guy realizes that Ace has taken back the guy's ex-girlfriend's dog, and races after him with a baseball bat, and manages to break both the front and back windows of Ventura's fixer-upper car, before Ventura manages to escape! Ventura not only gets paid in an unconventional way for getting the dog back for his client, but gets a naturally air-conditioned car in the process, a bonus from this case! 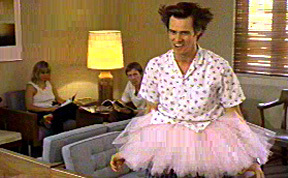 Another rather funny moment is when Carrey, while on the trail of a potential suspect, dresses in a tutu, pretends to be mentally ill, in order to get into the hospital's storage of patient's belongings, while his accomplice, Melissa Robinson (Courteney Cox), pretending to be his sister, supposedly checks him in. Cox went on to great fame on the hit TV series, "Friends." Thoroughly enjoyable is Carrey's impersonations of the Star Trek crew, while investigating the missing dolphins empty tank. Impersonations, one of Carrey's strong gifts, are often woven into his various movies, such as "The Mask." 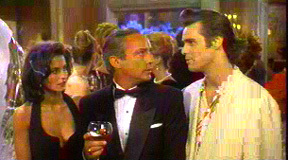 Another favorite scene takes place late in the film. A wild revelation, concerning Lieutenant Lois Einhorn's TRUE identity, is well worth waiting for, and a perfect caper to the crazy antics leading up to it. 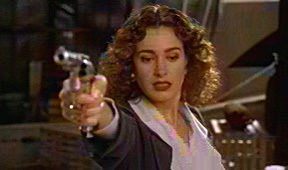 Sean Young, as Lieutenant Lois Einhorn, is well cast as a tough police captain, with a BIG secret. You don't have to like Young to enjoy her performance. The fine direction is by the talented Tom Shadyac, who has a flair for comedy. 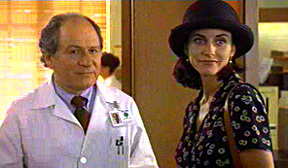 He also directed "Patch Adams," Liar Liar," and "The Nutty Professor." Sports fans may enjoy seeing quarterback Dan Marino and other Miami Dolphins in roles. While Marino doesn't embarrass himself, he should probably keep his day job. It is rated PG 13 due to some of the crude humor included in parts throughout the script, which isn't everyone's cup of tea. If you enjoyed ACE VENTURA, PET DETECTIVE you may like "Dumb and Dumber," "Hot Shots, Part Deux," "Airplane," "Doctor Dolittle," and/or "Ace Ventura: When Nature Calls."